Following the discovery of gold in Australia the NSW Legislative Council on 19 December 1851 addressed a petition to Her Majesty Queen Victoria seeking the establishment of a branch of the Royal Mint (London) in Sydney. The intention was to turn the newly won gold into sovereigns and half sovereigns, and to establish a point of sale where the miners would receive the official price of gold as opposed to the often paltry prices paid by the buyers on the fields. With the discovery of even larger gold fields, Victoria’s Legislative Council petitioned the Queen in July 1852 for a branch of the Royal Mint to be set up in Melbourne. The NSW petition, lodged 19 December 1851, was successful and the Sydney branch of the Royal Mint commenced operations on the 14 May 1855. Melbourne’s bid failed and it was not until 1865 that a further petition brought a favorable response. This delay is surprising in view of the fact that by 1860 there were over 80,000 alluvial miners on the fields and, by 1861 Victoria had over half of the Australia’s total population of 1,145,000. A proclamation and Order – in – Council issued on 7 August 1869 constituted the Melbourne branch of the Royal Mint declaring that: ‘gold coins made at the Melbourne branch Mint will be legal tender in all parts of Her Majesty’s dominions in which gold coins issued from Her Majesty’s London Mint are legal tender’. In 1853 a Captain of the Royal Engineers Edward Wolstenholme Ward, had been sent from Britain to establish the Sydney branch. In 1867, now a Colonel, E W Ward was appointed by the Royal Warrant as a Deputy Master of the Royal Mint London, and as the Deputy Master of the Melbourne branch. Patrick Forstall Comber, clerk of works in the War Office, was seconded to assist in the planning. Two assayers were appointed: a chemist and geologist from the goldfields, George Ford and Bank of England assayer, Robert Barton. Two further appointments were made from the Sydney branch staff, one was Robert Hunt and the second Francis Bowyer Miller. Colonel Ward in England oversaw the purchase of the engines, rolling mills and coining presses from Joseph Taylor of the Derwent Foundry, Birmingham, bullion and assaying balances from L Oertling, and automation balances from D Napier & Son. Colonel Ward sailed for Melbourne arriving there on the 14 October 1869. His assistant Mr PF Comber had arrived in April of the same year with the plans for the new building. The Lords Commissioners of the British Treasury wrote on 10 July 1869 to the Colonial Office advising that a detachment consisting of twelve noncommissioned officers and men, skilled artificers of the Corps of Royal Engineers, has been selected and instructed in the practical operations of melting and coining with a view to its employment at the same work at the proposed Mint. They arrived n Melbourne in January 1872. The new Mint fronted on William Street between Little Londsdale and Latrobe Streets. There were four buildings, one on each boundary, giving a central courtyard. The contract for the operative buildings was awarded to Messrs. Murray & Co., while the administrative building contract went to Messrs. Martin & Peacock. The administrative building is said to be the first public building in Melbourne not built of stone, as it was constructed of brick on a blue stone base. The cost of the building was 42,740 pounds ($85 480) and plant and machinery 25,760 pounds ($51 520). The first coins were struck several days before the opening during a visit from His Excellency the Governor and Viscountess Canterbury. The first two sovereigns struck during the visit were given to the Governor and Viscountess. These coins were replaced by two Sydney Mint sovereigns. 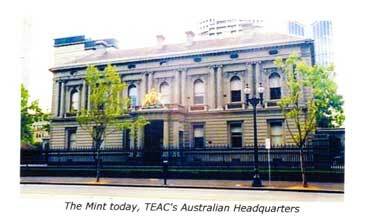 The Melbourne Mint opened for business of 12 June 1872. In the first half year of operation the new Mint achieved a total of 748 180 sovereigns. These consisted of two types: the Shield design by JB Merlen and the Benedetto Pistrucci St George and the Dragon type. In 1873, the first full year of production, 165,000 half sovereigns were struck along with 752,199 sovereigns. Production basically continued to increase, and 1880 saw the yearly total exceed 3,000,000 coins. Access to the Mint was strictly limited and accordingly, the Mint required a fully equipped workshop capable of building new machines. Originally the Mint had three blank cutting machines. These produced a single blank at a time, the gold strip being hand fed with the operator moving the billet forward each time just far enough to allow the full blank to be cut. Although the operators were experts, the need to produce millions of blanks per year must have exerted enormous pressure. The workshops produced another four presses. In 1879, which obviously helped towards the record production figure in 1880. In 1880 a washing machine for blanks was produced. Prior to this, all the gold blanks were washed by hand and dried with towels. In the preceding eight years the Mint had struck 13,530,894 gold coins which would have meant a pile of wet towels. A hydraulic metal press was designed and built in the workshops by George Bint during 1880-81. It was intended that the Mint would produce medals and had been supplied with a screw press, which was powered by two men who would screw the heavy flywheel up and then run it down as rapidly as they could. This press was used for the production of the 1880 exhibition medals consisting of 530 gold and 1450 silver and 1180 bronze. This work was obviously the catalyst for the manufacture of the press. From 1881 to 1921 the Mint produced small gold bars for the Indian market. They were generally 10 troy ounces, 99.6% gold with the alloying agent being silver. Annual production varied with the figure in 1903 being over 18,000. 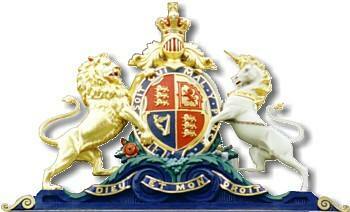 From 1872 the Mint received stocks of British coins which it issued on request to the Australian banks. It also exchanged worn or damaged coins for new ones. These coins were sterling silver (92.5% pure), and it did not make commercial sense to return the withdrawn coins to London when Australian jewelers were importing sterling silver. Accordingly, the Mint melted the coins and sold the silver ingots or strip, remitting the funds received to the UK Treasury. At first, Mint security was supplied by the military, but in 1873 the guard, consisting of two constables and a sergeant, was drawn from the police force. Although they were armed with carbines and Enfield rifles, the activities of the Kelly gang and other bushrangers caused alarm at the Mint, and the Deputy Master purchased six revolvers to be held by nominated Mint personnel. West Australian gold discoveries meant that the newly won gold had to be sent to either Melbourne or London, so action began to obtain a Royal Mint branch for Perth. The Western Australian Premier, Sir John Forrest speaking on behalf of the Perth Mint Bill on 9 July 1894 stated: The Melbourne Mint charges 2d (1.66c) an ounce (31.1g) to refine and coin our gold and since 1886 we have paid then 4,693 pounds ($9,386), money which could have been spent in WA. The Perth Mint branch opened for business on 20 June 1899. Following Federation moves began for Australia to have its own coinage. Various systems were considered including a decimal coinage based on the florin (two shillings) being one tenth of sovereign (1 pound). The Coinage Act of 1909 assented to on 4 September, set out a system basically the same as the existing United Kingdom coinage except that there would not be a farthing or a half crown. The First Australian coins were produced in London. Dated 1910, they bore the effigy of Edward VII. The first Australian bronze coins, the penny and halfpenny were dated 1911 and carried the effigy of George V. Australian coins were produced in the UK until World War 1. At the outbreak of hostilities, Great Britain suspended the active circulation of gold coins thus causing an upsurge in the demand for silver coinage in the United Kingdom. There were also problems in arranging shipping and accordingly the Treasury cabled Melbourne to prepare to produce the Australian silver coins. Arrangements were made for the Indian Mint in Calcutta to produce the Australian penny and halfpenny from 1916. In 1916 Melbourne Mint struck its first Threepence, sixpence, shilling and two shilling pieces, all of which carried a small “M” under the date. Melbourne continued to strike silver coins and started to produce the bronze coins in 1919. From this date onwards Melbourne was assisted by the Sydney branch with bronze and some silver coins, and by the Perth branch with bronze coins (except for 1,316,000 one shilling pieces dated 1946) Sole responsibility for the silver coinage returned to Melbourne with the closure of the Sydney branch in December 1926. In 1927 Melbourne produced 2,000,000 of Australia’s first commemorative coin – the Parliament House florin. Australia’s most famous coin, the 1930 penny was produced by the Melbourne Mint. The Royal Australian Mint’s coin was purchased at auction in 1965 for 195 pounds which on today’s market would realise over $25,000. The last sovereigns struck at the Melbourne Mint were dated 1931. 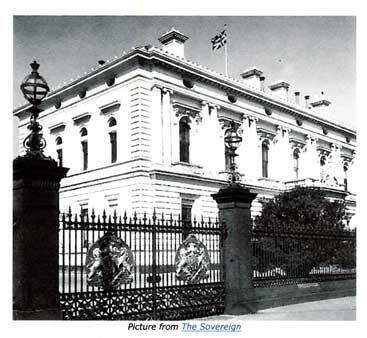 From the inception in 1872, Melbourne had produced 147,276,611sovereigns and 1,893,559 half sovereigns. The Mint continued to accept both new and old gold for processing. With the effect of the Depression being felt by increasing numbers of the population, the Mint was flooded with small deposits. Many unemployed were reworking old diggings and mines, and a lot of people were surrendering their jewelry. The Coinage Act of 1909 had allowed for nickel coinage and in about 1918 an approach had been made to the Melbourne Mint regarding replacement of the large bronze pennies and halfpennies with much smaller cupro- nickel coins that were square with rounded corners. The Commonwealth Treasury in 1919 placed an order for 10,000 pounds in bronze pence with the order commencing……pending the introduction of nickel coins ….This convinced the Mint that the introduction of the nickel coins was imminent. Dies dated 1919 were prepared and 32 bars of die steel were ordered from London. Although new dies were prepared in 1920 and again in 1921, the Treasury never lodged an order for the nickel coins. Accordingly, the pieces struck to test the dies are now regarded as the Kookaburra patterns. The Melbourne Mint produced coins for the Territory of New Guinea starting with 48,000 pennies and 24,000 halfpennies made of cupro-nickel dated 1929. These were never issued by the administrator; however a small number of selected specimens were issued by the Mint. The next issue in 1935 consisted oft Threepence, sixpence, one shilling and in 1936, a shilling with George V’s monogram and a penny with Edward VIII’s monogram. The next issue in 1938 was a penny and shilling (George VI), a sixpence dated 1943, a penny and a Threepence dated 1944 with a final issue being 100,000 of the shilling coins dated 1945. In 1934 the Melbourne Mint produced its second commemorative florin, the 1934-35 Melbourne Centenary. The coin was issued at three shillings with the one shilling surcharge going to the Victorian Centenary Council. 75,000 were produced, but only 54,000 sold with the balance being melted. The crown or five shilling piece was first produced in 1937 and was regarded as a commemorative for the coronation of King George VI. The coin seemed popular with the 1,008,000 produced rapidly dissapearing. When the coin was first struck again in 1938 it was realised that the public did not like the crown. Production stopped after only 101,600 were struck. During World War II, the United States of America Mints in San Francisco and Denver produced large quantities of Threepence, sixpence, one shilling and two shilling coins. The silver was supplied under the lead-lease system, which meant it would have to be replaced the war. Accordingly in 1946 the Mint started producing Australian coins of 50% silver instead of the former sterling silver (92.5%). As supplies of the new coins became available, the old coins were withdrawn, melted and made into blocks of 92,5% silver. The surplus left after repaying the United States was refined to pure silver and sold. In the early 1960’s the Commonwealth decided to introduce decimal currency and to establish a Mint in Canberra. This new Mint basically meant the end for the Melbourne branch accordingly the positions in Canberra. A substantial number of them accepted the offer and formed the nucleus of the new Mint’s staff. Despite the big reduction in the experienced staff (most of whom had left for Canberra by the end of 1964, the Melbourne Mint had produced nearly 416,000,000 decimal coins by the end of 1967. 1968 was windup- up-year, but 19,930,000 one cent pieces were produced before coining ceased in June 1968. The Royal Australian Mint was offered fist choice of the Melbourne equipment and purchased a number of items including the small bullion balance. One of the original coinage presses cast in 1868, was presented to the Royal Australian Mint and can be seen in the public gallery. Larger items were sold by tender, whilst smaller items went to auction. Technical journals, records books etc currently reside at the Public Office Repository at North Laverton. Most of this work was overseen by Mr W J Mullett who stated: ‘one of the last actions of the Melbourne Mint as the return to London of the seals used to impress the wax seal on the boxes of sovereigns and half sovereigns. With the tasks completed, he left for Canberra in June 1969 to take up duties at the Royal Australian Mint. The final act was a proclamation by Her Majesty Queen Elizabeth II on the 29 May 1970 and where as it appears to us desirable that the establishment of the said branch Mint (Melbourne) should be discontinued.